Raw Vegan Recipes & More! You will teach me how to make this recipe, no? I’ve been thinking about raw vegan lemon squares since I put the date for the next Conscious Eating Niagara potluck in my calendar. Well that day is today, and I’ve whipped up two 9X9 inch pans of raw vegan lemon squares which are now chilling in the freezer. I was a little bit concerned about trying out this new recipe on the day I plan to serve them, but I did a taste test on Geoff and he gave it a big thumbs up! I couldn’t find an existing recipe for raw vegan lemon squares online. There’s one really amazing looking recipe for raw vegan lemon meringue pie which I’d like to try at some point, but it requires Irish moss which I have yet to acquire. Otherwise, lemon recipes are mostly reserved to cheesecakes. Well, no more! 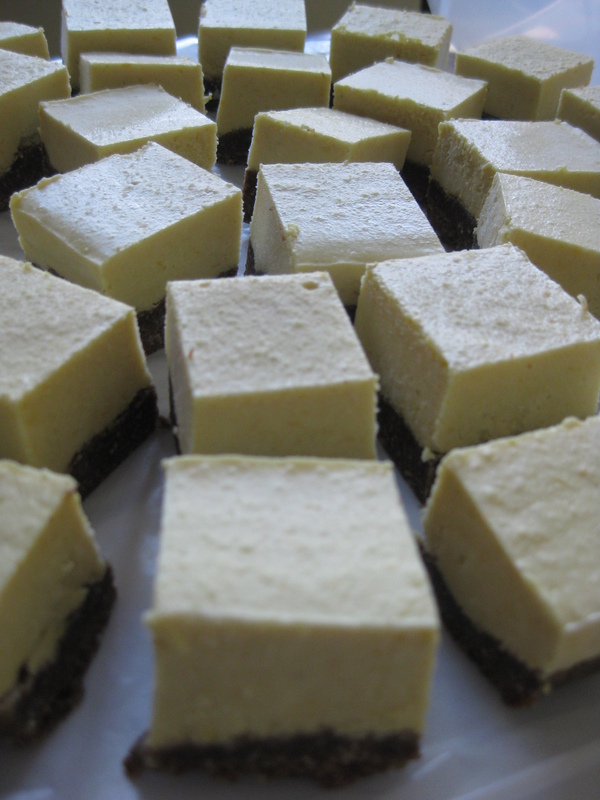 Here’s my spin on a delicious raw vegan lemon square recipe. 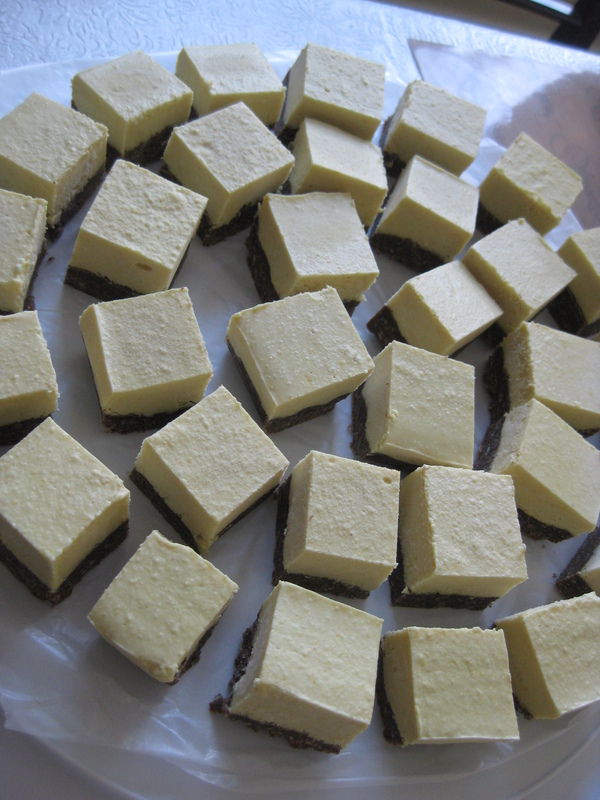 For my updated Totally Fabulous Raw Lemon Squares recipe, click here. Blitz the coconut butter in the food processor. Once smooth, add the lemon zest. Blend. Add the the coconut milk. Blend. Add the lemon juice. Blend. Add the agave and pulse a few times until it comes together. Do not over blend. Please see my post about pie, cookie & brownie crusts. Once you’ve pressed made your base, add the filling and let chill in the freezer for at least one hour, or in the fridge for at least 3 hours. Cut in to squares and serve! This entry was posted in All Recipes - Recipe Index, Dessert Recipes, Gluten-Free Recipes, Raw Food Recipes, Sugar-Free Recipes, Vegan Recipes, Wheat-Free Recipes and tagged best raw vegan lemon bars, best raw vegan lemon squares, lucuma, raw agave, raw lemon bars, raw lemon square recipe, raw lemon squares, raw vegan desserts, raw vegan lemon, raw vegan lemon bars, raw vegan lemon meringue pie, raw vegan lemon squares, raw vegan lemon tarts, raw vegan recipes by Mandi. Bookmark the permalink. I think you have outdone yourself. This looks wonderful and a thumbs up from Geof just pushes me over the edge. I will save this recipe. When my daughters gets settled in their new home, I will pull these recipes out and let them try their hand at it. Thanks!!!! Mmmm, these were delicious last night at the potluck! Thx for posting, Mandi, you see I came to find out more!